Low-end Android handsets in developing markets sell in the $70-200 range (without carrier subsidies). They’re typically equipped with processors from Chinese manufacturers like MediaTek, Allwinner, or Rockchip — often with anemic ARM11 performance in tow. Buyers wanting a smooth Android experience have to step up to more expensive phones. Into this void stepped Intel, which announced its new Atom Z2420 processor at CES a few weeks ago. Formerly codenamed “Lexington,” the mobile platform features a single-core 1.2 GHz CPU with HyperThreading (a lower-clocked version of the 1.6 GHz Z2460 Medfield / Penwell chip in the Xolo X900), PowerVR SGX540 graphics, Intel XMM 6265 HSPA+ 3G radio (a variant of the XMM 6260 adding dual-SIM support– important for developing markets), MicroSD support, FM radio, and even Intel’s Wireless Display (WiDi) technology, which can stream 1080p HD video to Wifi-connected TVs. The chip supports up to 1.3 MP front and 5 MP rear cameras and can record and play back 1080p video. 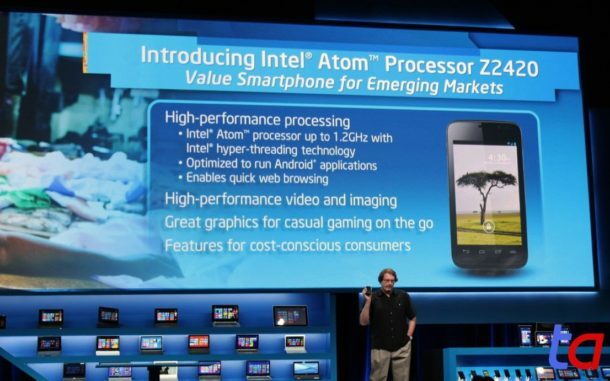 As with Intel’s first smartphone processor, the new Lexington platform was accompanied by a “shipping quality” reference smartphone (“FFRD,” or Form Factor Reference Design) to help manufacturers get off the ground with its chip. Safaricom of Kenya and Lava Mobile of India are bringing variants of this design to market, as is Acer. Today we have the first benchmark results from the Safaricom phone, dubbed “Yolo,” and they’re quite surprising. The 3.5″ HVGA (320×480) phone includes 512MB RAM, 4GB storage, 5 MP rear camera (no flash), MicroSD slot, and Android 4.0.4, and sells for 10,999 KES ($126). Note: some versions of the Galaxy S3 (e.g. most of the U.S. versions) have a dual-core Qualcomm Snapdragon S4 processor instead of the quad-core Exynos and will thus produce different benchmark results. See here for a review of the Yolo. The phone will hit India shortly as the Lava Xolo X500, retailing for Rs. 8,999 ($167). Still, the Lexington platform’s performance in such a low-priced handset bodes well for Intel’s future in the smartphone industry.